Heat oven to 375°F. Spray cookie sheets with cooking spray. Remove dough from can; separate into 12 breadsticks. Cut each into 4 pieces; flatten each piece. For each appetizer, place 1 olive in center of each piece of dough. Wrap dough around olive to completely cover, stretching dough to fit if necessary and pressing edges firmly to seal. 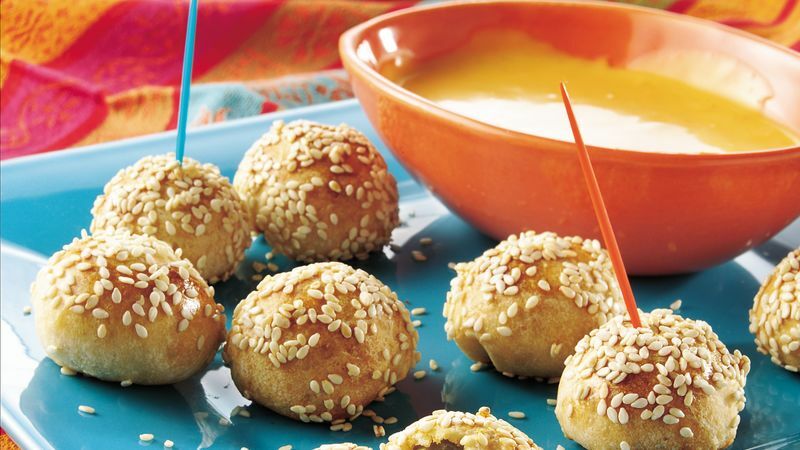 Dip tops into beaten egg, then into sesame seed; place seam side down on cookie sheets. Meanwhile, in 1-quart saucepan, mix cheese sauce, tomato juice and ground red pepper. Cook over low heat 3 to 4 minutes, stirring constantly, until cheese sauce melts and mixture is well blended. Serve as dip with warm appetizers. This recipe requires two cookie sheets. Both sheets of the "bites" may be baked at one time if the sheets are rearranged front to back and top to bottom halfway through baking. However, baking one batch at a time ensures a steady supply of hot appetizers.